Don't fall for the trap. It feels like summer is winding down. State fairs are here, kids are going back to school, and Labor Day weekend is just around the corner. But that doesn't mean summer is over. It's going to be warm for a while, and you should definitely try to eat as much ice cream as possible before "ice" becomes associated with scrapping windshields rather than relief from the heat. Dairy Queen is offering the chance to help you discover exactly how much ice cream is too much ice cream. 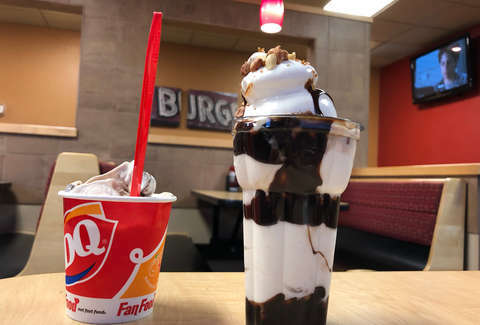 Using the DQ mobile app, you can find buy-one-get-one-free (BOGO) deals that include BOGO small sundaes and BOGO malts and shakes of any size. You'll find those offers in the "deals" section of the mobile app through September 2. If that's not enough ice cream, there's one other opportunity to land free frozen treats. If you haven't already downloaded the app, you can get a free Blizzard just for signing up. You don't have to buy anything. That's just a freebie. If you're enjoying the transition from summer to fall, you could try out the new Pumpkin Pie Blizzard. It's maybe a little early for fall foods, but you're your own person. Do what makes you happy.